Pitru Paksha period (the waning phase of moon in September – October) is considered to be a highly meritorious period for making offering to dead ancestors, parents and relatives. One of the important stories associated with Pitru Paksha is related to Karna of the Mahabharata. The Origin of Mahalaya Shradh starts with the charity that Karna performed on earth. 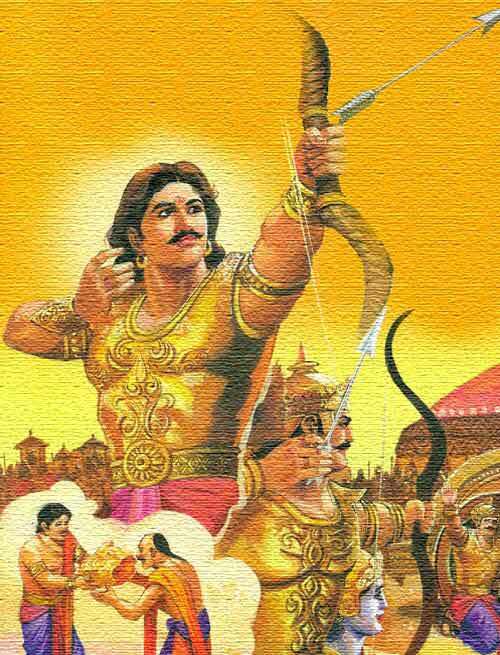 Karna was known as Dhanveer – one who performed the greatest of the charities. So when he died and reached heaven the great charity that he had performed in his lifetime was returned in hundredfold. But sadly Karna did not get any food in the heaven – all he got was gold and silver. This was because he had not done any food charity. So he prayed to Lord Yama for forgiveness. Yama advised him to go back to earth for fourteen days and perform food charity. For the next fourteen days, he fed the poor and offered oblations of water. On his return to the heaven, he received food in plenty. These fourteen days came to be known as Mahalaya Pitru Paksha period. Yama gave the boon that those who make offering during the period to the dead ancestors, dead parents and dead relatives will get the offerings immediately and their souls will not wander around aimlessly. The pious act of feeding the poor during the period will help in attaining Moksha.